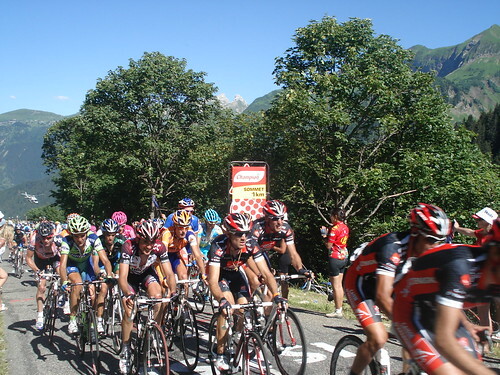 Here is stage one of the upcoming July 2008 Lost Boys Tour d'Enfer. A trip organized by my friend Leslie that will include people from the USA, Canada, France, Turkey, Germany, and Switzerland. 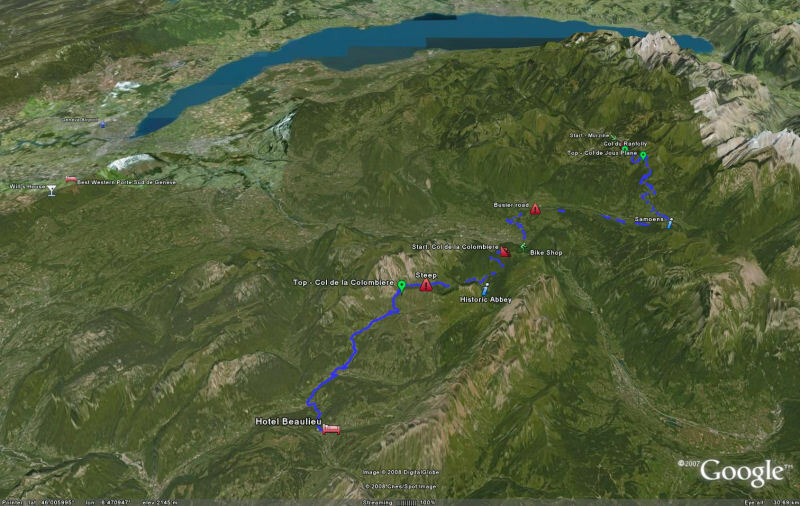 This summer I will ride a week long cycling tour broadly following the Route des Grande Alpes. It will include many of the most famous climbs in France. We are all getting a little excited as hotels get reserved, plane tickets bought and the plans generally firmed up. 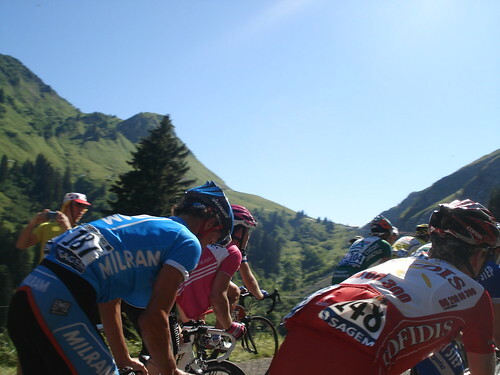 So here is stage one of the upcoming July 2008 Lost Boys Tour d’Enfer*. A trip organized by my friend Leslie that will include people from the USA, Canada, France, Turkey, Germany, and Switzerland. 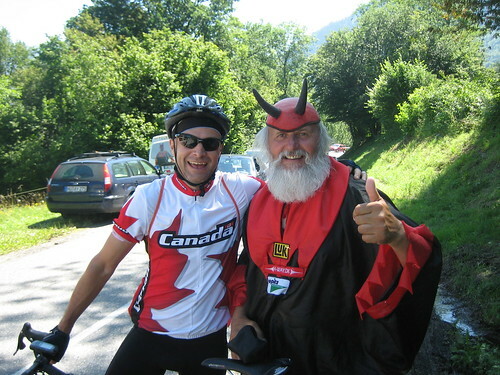 All 2008 Tour d’Enfer previews are here. After meeting in Geneva (click “View Larger Map” link below map to see Geneva hotel) we will drive to Morzine to begin the first day. The route will include two great climbs: Col de Joux Plane and Col de la Colombiere (details below). Day one and the first mountain starts immediately from Morzine. And the beginning of this legendary climb is steep – with two kilometres at 10% – welcome to the Alps! 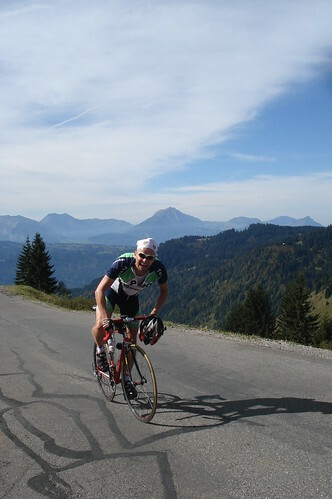 Le Cycle Magazine in 2005 included Col de Joux Plane in its list of the 30 most beautiful climbs in France – and if it’s sunny you will be rewarded at the top with great views of Mont Blanc. We will be climbing the less famous but still challenging North side and descending the South side. Col de Joux Plane first appeared in the Tour de France in 1978, then five times in a row from 1980 and is now a regular stop for the Tour. It is one of the very few climbs that has seen Lance Armstrong struggle. Back in 2000, French hero Richard Virenque left Armstrong far behind on Joux Plane to win the stage. 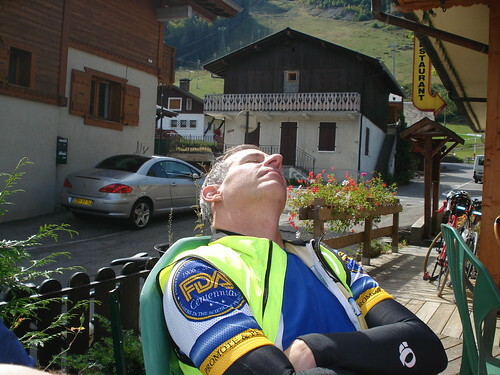 In 2006, Joux Plane was the final climb on the great comeback ride by Landis. After a pretty hairy descent to Samoens, we’ll ride through a scenic, fairly flat valley before starting a little climb and long descent towards Cluses and the start of the next big climb (this middle stretch will be busier traffic wise). Colombe means “Dove” in french. We will be climbing the Col de la Colombiere from its classic north-east side. Since 1960 this Col has appeared 18 times in the Tour de France including stage 7 in 2007. It was also included in Le Cycle’s list of the 30 most beautiful climbs in France. The last stretch gets quite steep and is often into a head-wind. From the top of Colombiere, it’s only 17 kilometres (10.5 miles) to the hotel, after a long, very fast descent, the last 4 kilometres are uphill – though not at all steep – they might really hurt after a big day. Note: There are a bike repair stores in Morzine and an excellent one on today’s route in Cluses (see map). Ride past Morillon for several kilometres. 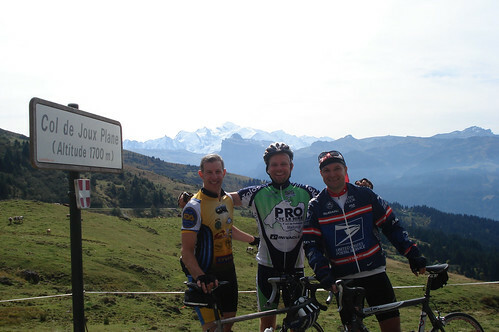 Small climb up to La Clusaz and the Hotel Beaulieu – congratulations! WOW– I’m so jealous. This blows away my summer vacation plans (OK no plans yet but still… I can’t touch this). I think I’m going to do my best to smooze myself into next year’s ride… or I’ll just follow your maps and show up in your line of riders one day. 🙂 Looking forward to seeing more.